The post that hooked me in was by the author, S.M. Wheeler, about Krackens. I waited and waited for that darn book to be released via Nook, and when it finally was I was in the middle of a monster 1100 page Goliath (which was a disappointment and shall remain nameless for now). 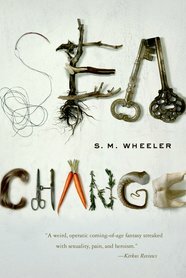 Sea Change clocks in at 203 pages on my Nook. It might be small, but it packs a mighty huge whallop. PLOT IN A JOT: Lilly has a crappy home life with her privileged family, and when her only friend (a kracken) goes missing, Lilly sets out on a quest to save him. The fairytale convention was very smart on the part of the author. It allows a distance between the reader and the story. This is a deep, darkly disturbing story and I’m not sure I understand the half of it. But it has been bothering me, especially the ending. What the hell? I understand not every fairy tale came with a happy ending, but they did come with closure. I didn’t get any closure with this one. Ok. And for all you writers out there… If you are going to put a magic freaking box in the story, given as a gift and then given to someone to save for your character… and a big deal is made of it… IT NEEDS TO COME BACK IN AT THE END OF THE STORY. I can’t lay my eyes on the part of the story where she leaves it with her step mother, but she says something about a secret being in the box or something (darned nook! I could have found the passage in a real book!). When she came home, I kept expecting that box to pop up. Never did. What?! I can’t really rate this one. It’s definitely not a Wheee! Of a book. Or even a Whoohoo! It was too distant to produce tears, but I’m still thinking of it 2 days after finishing. So maybe… 4/5 woeful wandering thoughtful of a book?